Do not wait until the time of calculating your monthly business spending and revenues to prepare invoices. Keep your business’ financial records properly organized by recording your outgoing and incoming invoices. 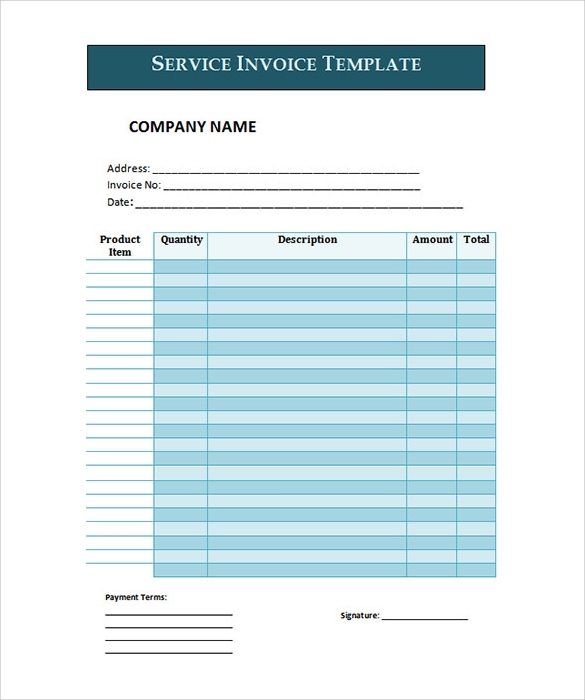 With tens to hundreds of free invoice templates available free for download, you can get them online and use them to generate sales and purchases invoices either manually or electronically. The printable templates, built from scratch for you, feature high quality designs and well thought-out layouts, which actually makes them the perfect choice for the job. 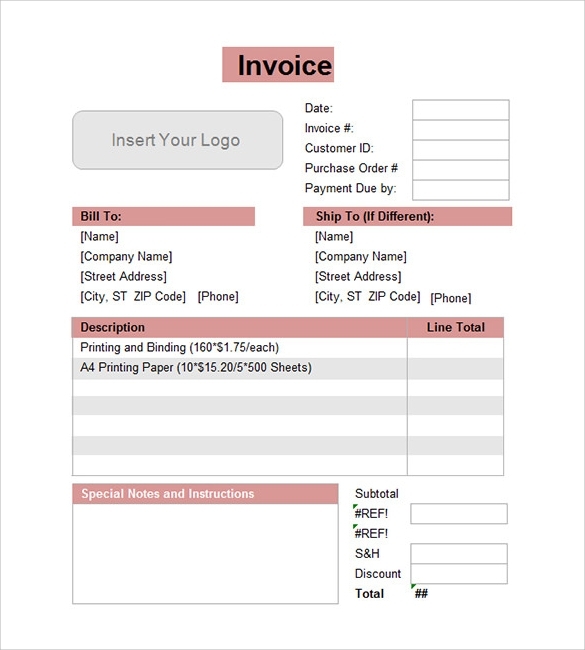 Whether you are getting hundreds of customers or just a few and whether you are buying items daily or partially within the week, the blank invoice template makes the best choice of tools to use. Whatever be the kind of services you are hiring out, a well-designed invoice is essential to ensure timely payment. These service invoice templates include description of the services provided, the duration of the work, amount of tax, total costs and the names and details of the parties involved. 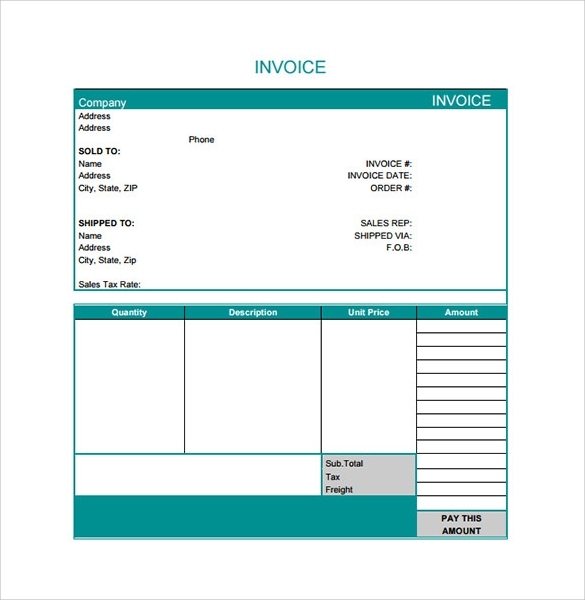 If you are looking for a basic invoice templates, these templates are sure to be useful to you. These templates can be used by various kinds of small service businesses – they include details of the services provided, unit price of each service, total costs and the names of the parties involved. These general billing invoice templates will enable freelancers, consultants, accountants and other service providers to bill their clients in a professional manner. These templates, with clean and efficient design, contain convenient spaces for details of the services provided, the terms of payment, discount (if any) and the names of the parties involved. As a contractor it is necessary to list the details of the services you have provided, the duration of the service, cost of labor and materials, terms of payment and charges of the services. 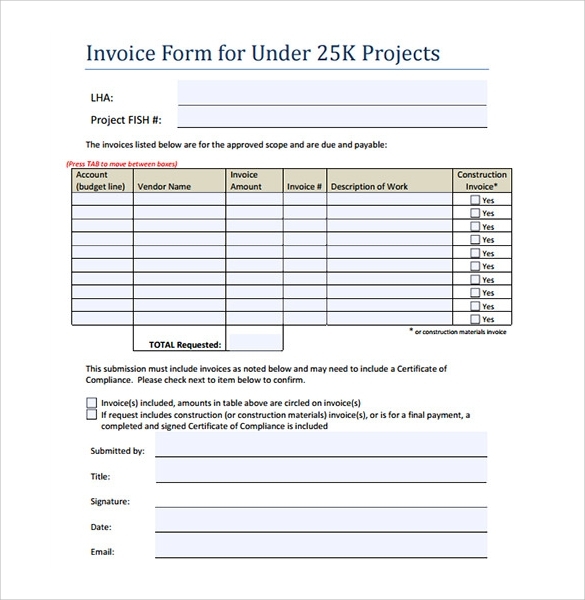 Our collection of construction invoice templates including all such details will be extremely helpful in ensuring timely payment. 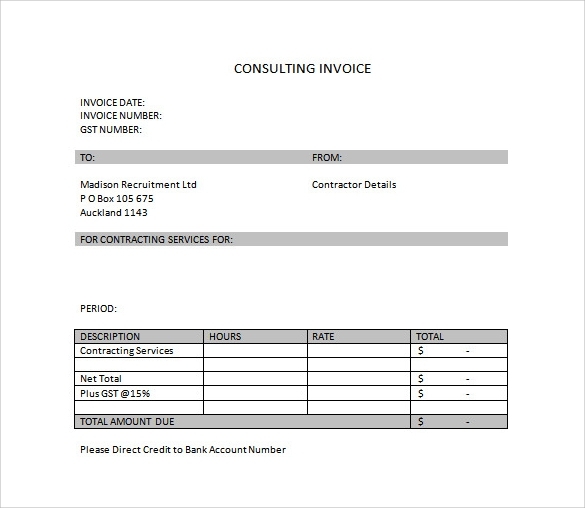 If you are a consultant hiring out your services, you need to have a working consulting invoice to bill your clients. It should include the details of the nature and duration of the consulting services provided as well as the names of the parties involved – these consulting invoice templates will prove to be very helpful. If you are a freelance photographer, it is essential that you have professional looking invoices to bill your clients, in order to ensure timely payment. 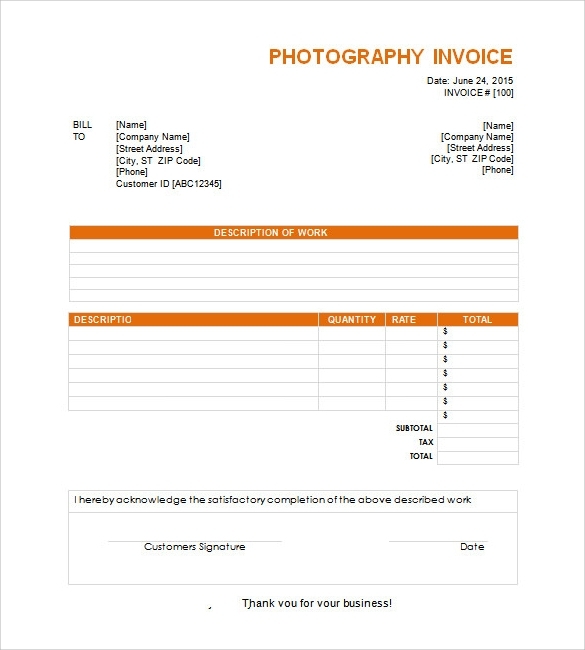 These photography invoice templates that include description of the work, duration of the services and additional costs (if any), will make your business run smoothly. 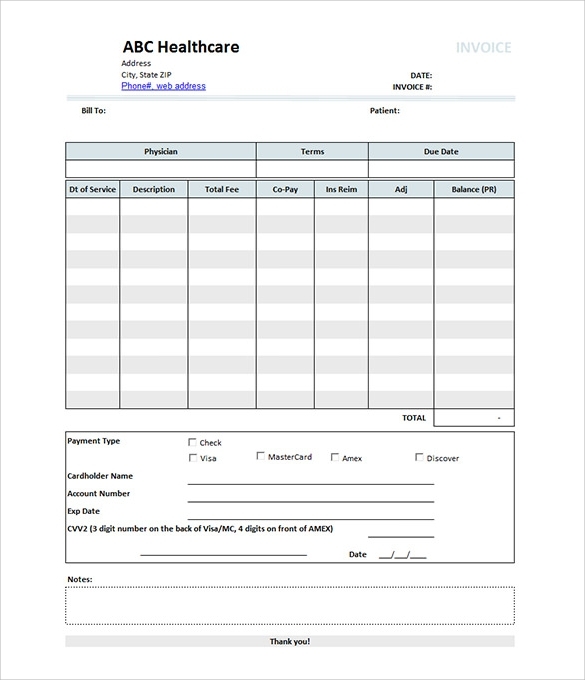 These medical invoice templates will be useful for all kinds of health providers, pharmaceuticals, hospitals and health care centers. These templates includes details about the date and description of service as well as health insurance related details, credit card details, name and address of the patient, etc. for easy billing. 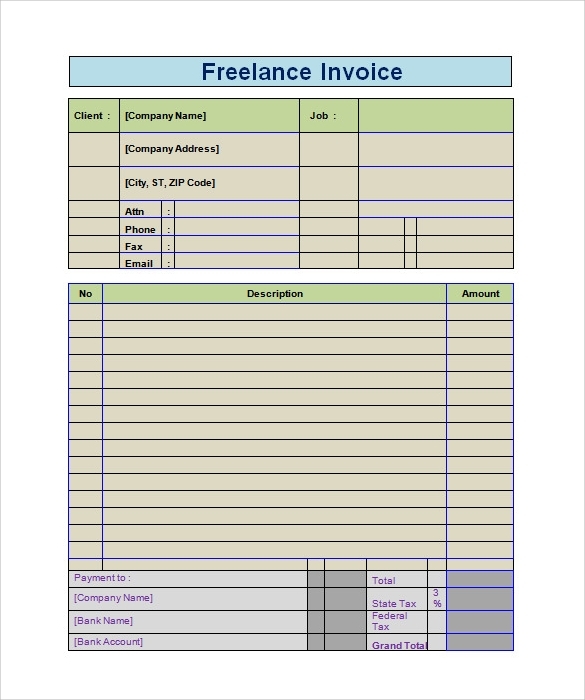 These well designed freelance invoice templates are an excellent choice for freelance photographers, editors, designers, developers, translators, etc. to bill their clients with. The templates include details of the description of the job, the number of hours, cost per hour, the total costs and the names of the parties involved. 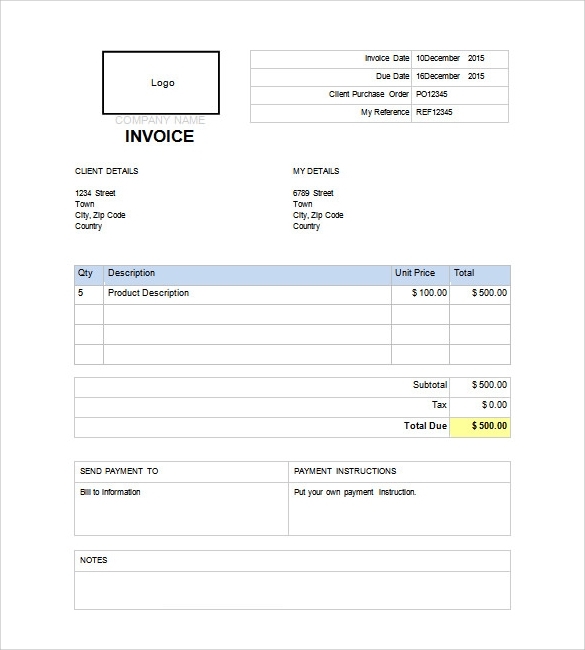 To compute and send the bill of your catering services of an event to your client, you need a catering invoice template. 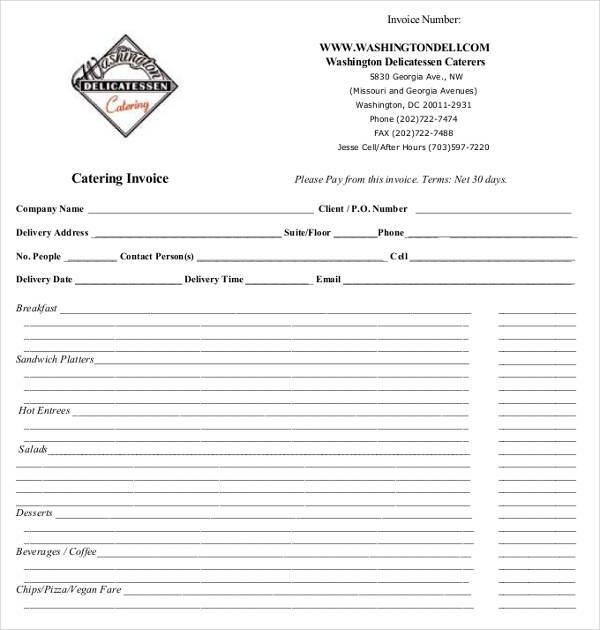 These templates include a section each for the description of the catering services, the price for each item, a total amount for each service as well as a grand total. A well-laid commercial invoices is necessary in the import/export/shipping business. These commercial invoice templates include details of the item, its weight, its unit price and the total price, along with name of the country of origin, final destination, terms of sale, terms of payment, terms of freight, number of packages, etc.